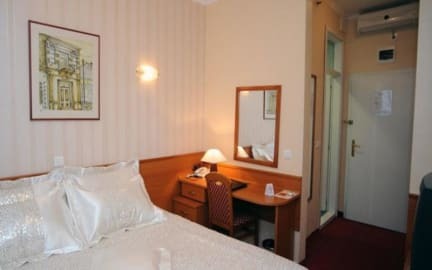 Epinal Hotel is surrounded by some of the most well known points of interest in Bitola this beautiful hotel is ideally located on the main street Shirok sokak, 175 km from the Skopje Airport, 180 km from Thessaloniki and only 15 km from the Greek border. Whether your plans include meetings, conventions or leisure, Hotel Epinal can accommodate you in style and assist you with professional quick and convenient service, while offering a variety of amenities to make your stay a most rewarding one. Customer satisfaction is the number one priority and all guests enjoy the highly professional, courteous service with a warmest hospitality and smile. Each of 66 spacious, comfortable guest rooms, 6 deluxe rooms and 2 presidential suits at the Hotel Epinal is tastefully decorated with pretty, modern furnishing and fully equipped to meet the needs of today's traveler: en-suite bath, air-conditioning, internet connection, hairdryer, cable TV and direct-dial phone. Hotel Epinal is centrally located in Bitola, opposite the Cultural Centre and only 15 km away from the Greek border. 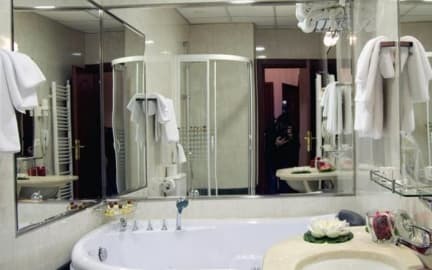 Surrounded by some of the most well known points of interest in Bitola this beautiful hotel is ideally located on the main street 'Shirok sokak', 175 km from the Skopje Airport, 180km from Thessaloniki. Numerous shops, restaurants and cafes are within 100 m from the Epinal. Bitola's Main Bus as well as Train Station is 1.5 km away. Skopje and Skopje Airport are 175 km from Bitola. The long standing memories restaurant Gradska Kefeana offers a wonderful dining experience for business lunches, romantic dinners by the fireplace, pre & post theatre & special occasions. In the summer you can enjoy a pleasant evening dining out on the terrace. Whether you are in Bitola on business or for pleasure, there's always time for you to relax and revitalize. A delightful 22 metre long, heated Swimming Pool is the perfect setting for lap swimming. Relax your body and calm your senses with our rejuvenating Sauna or Steam Bath. Enjoy unlimited use of the fully equipped Fitness Centre featuring programmes, strength training through body conditioning machines, and the cardiovascular equipment. Massage for total body relaxation - just the thing to calm down after an active day. An ideal place to restore the balance of body, mind and spirit. Feel your life come alive in a dazzling world of Le Grand Casino - Epinal gaming excitement! Be welcomed by our friendly employees, excellent service, live music and sizzling casino gaming action. The Epinal casino has the newest, hottest slots, expanded Poker room and all your favourite table games including Single-deck Blackjack, Roulette, Craps, Poker, Baccarat, Texas Hold'Em. In case of the Late Cancellation/Early check-out/Non show the penalty in the total amount will be charged by Click and Book Travel from the provided credit card.